FLORIDA KEYS FLATS FISHING AT ITS BEST! Stalk the flats and bays of the Florida Keys and the Everglades National Park with an expert guide. 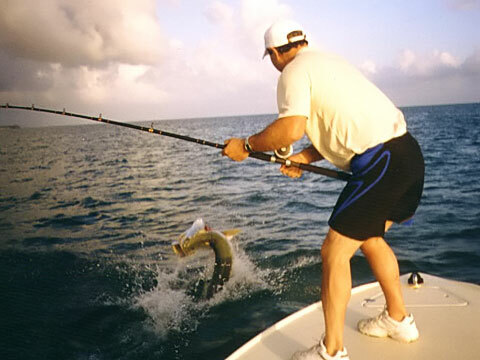 Catch Tarpon, Bonefish, Permit, Shark, Redfish, Snook, and Spotted Seatrout. All bait, tackle, license, and ice are on board at time of departure. Thanks to the warm tropical climate of the Islamorada/Key Largo area we are able to fly fish and light tackle live bait fish the year round for most species of shallow water game fish. Spring is a season I always look forward to because of the giant tarpon migration that fills in the inlets and channels with one hundred to two hundred pound silver warriors. The fish are so thick that I guarantee you will hook up tarpon on my special, early morning, live bait tarpon trip. Call me for the details. If shark is your passion, I will guarantee hook up for shark all year long. The Florida Keys have long been a destination for bonefish anglers. The average bonefish is very big. Nearly every fish is a trophy. Live bait or fly is the equipment used but the method is more akin to hunting than fishing. Bonefish are extremely spooky so one must stalk each individual fish and maneuver the boat into a position that will afford a hook up before the fish ever knows you are there. Permit has long been one of my favorite species to hunt. I guide my customers to permit that are usually on the flats or searching the edges of the shorelines and bars. The typical fish is over twenty pounds and when using eight pound line you are sure to have a thrill. A permit caught on the flats is always on the top of my list. I specialize in sight fishing which is demanding yet thrilling method of angling. Our backcountry is mostly within the Everglades National Park. Four hundred plus square miles of shallow flats, bays, and small mangrove islands wait for you to come explore. Catching Shark, Redfish, and Snook or just a relaxing day fun fishing at Flamingo in Florida Bay will leave you with memories you will keep forever. Floridaâ€™s finest flats fishing is definitely found in the Florida Keys. Our fishing grounds are the best Florida has to offer. I guarantee my very best efforts to give you a fishing trip you will not soon forget.